Another year has come and gone, and with 2018 just around the corner, it's time for me to look back and reflect on what a great year 2017 has been. This year was a pretty exciting year for my blog. In June I was awarded Silver in the Kent Digital Awards, in the Entertainment Blog category, and then later in the year I was a finalist in the Favourite Blog category of the Theatre Community Awards. I'm forever amazed by the fact that people read my blog and value my opinions, and being nominated in two different awards in 2017 felt really lovely. In more personal news, I graduated from the University of Kent this year, with a degree in Drama and English & American Literature, and started a career in the arts, which was a dream come true. I moved to Stratford-upon-Avon for work, and so obviously I saw everything that the RSC had to offer during my time there, and visited loads of other great theatres in Warwickshire and the West Midlands too. I even wrote a few blog posts about the RSC's The Other Place, which can be found alongside some other brilliant blogs on the RSC Website. But enough about my personal life! 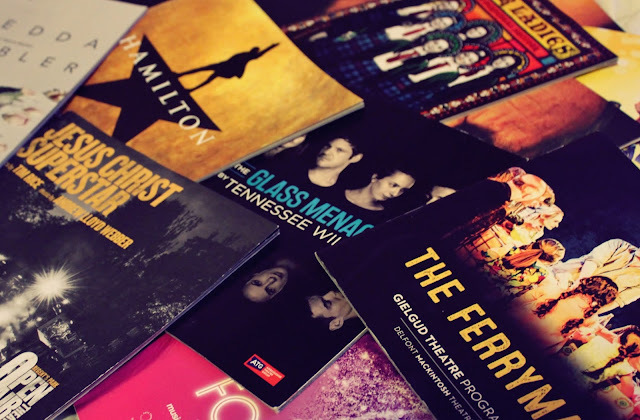 I've seen some totally wonderful theatre this year and so with that in mind, here is a list of the 5 shows which had the biggest impact on me in 2017. I thought long and hard about which show I should put at number 5 on my list. I've seen loads of great plays, musicals, ballets and operas this year, and really they all deserve to be shouted about. That being said, when I was looking back over the reviews I wrote in 2017, one kept jumping out at me, and that was my review of London Musical Theatre Orchestra's concert production of Honeymoon in Vegas. I have admired LMTO for a while now, and I really enjoy the way they take lesser known or lesser performed musicals, and bring them to life, even if it's only for a night or two. As a fan of Jason Robert Brown, I loved hearing the brilliant Honeymoon in Vegas score being brought to life by such a talented orchestra, and in the lead roles of Betsy and Jack, Samantha Barks and Arthur Darvill were a perfect pair. It seems like LMTO gets bigger and better every year, and I can't wait to see which musicals they will tackle next. In 2017 no show surprised me more than this one. On the surface, Our Ladies of Perpetual Succour was a riotous no holds barred adventure, following a bunch of unruly ELO spouting youngster, let loose on Edinburgh during a school choir competition. It certainly had its fair share of rather outrageous content, but at its core it was something much more profound. Our Ladies of Perpetual Succour was a raw and real portrayal of 6 very different teenage girls, all trying to navigate their way to adulthood in different ways. It earnestly explored some sensitive themes, such as teenage pregnancy and terminal illness, from a very realistic perspective, and it was cathartic to see such realistic depictions of young women on stage. The enormous hype which surrounded this show since it first opened in America was impossible to ignore, and therefore expectations were high when a London transfer was announced. Fans and sceptics alike wondered weather the fundamentally American story would resonate with audiences in Britain. Thankfully, the excitement which followed Hamilton wherever it went was more than warranted. I was struck by the extent to which Hamilton felt like a new frontier, worlds away from the usually great, but increasingly predictable mainstream musical theatre. The London production was impeccably cast, showcasing some of the most talented performers working today, and heightening the musical's already formidable songs and raps. It seems very likely that Hamilton will experience a long run on the West End, and rightly so! For all the talk I talk about wanting to see fresh, groundbreaking theatre, for me very little compares to a big, glitzy musical. And this year no musical was glitzier than 42nd Street. With its gloriously bright and colourful design, and incredibly talented cast, whose megawatt smiles radiated from start to finish, 42nd Street was completely irresistible. It felt like a couple of hours of pure distraction from the outside world, and I left the theatre humming and tapping my toes. Sure, it's relatively safe, and quite old fashioned, with some rather outdated aspects, but it's also unapologetically fun, and isn't that exactly what we needed in 2017? I was completely bowled over by John Tiffany's production of The Glass Menagerie, which transferred to the West End after a run in Edinburgh during the EIF in 2016. Tennessee Williams' semi-autobiographical play offered a fascinating look into a tumultuous family trying to thrive in 1930s St Louis, Missouri. Kate O'Flynn gave a spectacular performance as the fragile young Laura Wingfield, opposite Brian J. Smith's charismatic Gentleman Caller. Not only was the story immensely touching and complex, but the production itself was gorgeously designed, and complemented the play's dreamlike quality. When it was over and the actors had left the stage, all I could do was shake my head in awe! Whilst The Glass Menagerie is certainly not a groundbreaking play by today's terms, Tiffany's production felt totally fresh and unpredictable, and made a huge impact on me. Even now, it's hard for me to put into words just how much I enjoyed The Glass Menagerie, which I ended up seeing 3 times in London. From the first time I saw it I knew it'd end up on my end of year list, and looking back on 2017 I can safely say that no show this year left an impression like this one did. Of course, a top 5 list is quite restrictive and although they didn't make my list I should probably mention a few more outstanding shows from 2017. I thought that Blanche McIntyre's production of Titus Andronicus at the RSC was really very emotional without being excessively gory, The Ferryman was a simmering play which bubbled over in the final act to horrific effect, and in contrast I really enjoyed the unabashedly silly The Wedding Singer which left me with a big grin on my face. There's no denying that 2017 has been a brilliant year for theatre, and I can't wait to see how 2018 compares. I'm particularly excited about the transfers of Strictly Ballroom, Fun Home and The King And I, all of which have been received really well elsewhere. No doubt loads of unexpectedly great pieces of theatre will crop up throughout the year too, and I'm really excited to see what's in store.